This wine was purchased in a wine emergency. We wanted something nice, something fresh, and something that was available after eight o’clock on a Sunday night in Cardiff as all the restaurants we’d thought of going to were closed – it was Sunday night after all. There were some chain restaurants still open, but after a fruitless trek across town to a restaurant that had been recommended, then an equally fruitless trek back to a cocktail bar that had been similarly talked up, we’d settle for a swift half in a brew pub and agreed that fashioning a Waitrose picnic would be a better choice than Sunday night room service. To add to our woes, by the time we’d walked back to Waitrose, it had closed, even their little city centre stores have an 8pm shut off. A little more strolling around Cardiff is no hardship. It’s a pretty city with friendly locals, although they can get far friendlier than you may have bargained for on a Friday and Saturday night. We found a Sainsbury’s local that had a limited selection, but enough to pull together our little picnic. 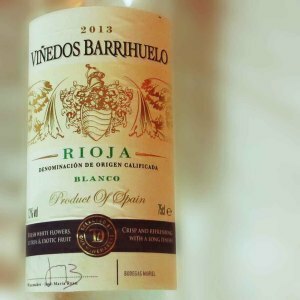 This Taste the Difference Vinedos Barrihuelo Rioja Blanco 2013 seemed like the best wine choice with a screw cap, so I picked it up, but how would I keep it cool? I did think about buying some ice cream to cool it with, which we could have, slightly soft for dessert, but despite not having much in the way of foodstuff, the freezers in the central Cardiff Sainsbury’s local had two whole shelves of bagged ice. They know their market well. The wine was pale lemon and smelled encouragingly fruity. with some apple blossom and citrus zing. It’s dry, but not as dry as I expected from a white Rioja, with a medium acidity and no tannin, there was no oak. I’d rather expected oak, but I hadn’t read the label, so instead of an old style traditional Rioja I could “Taste the Difference” in this one as the fruit led the flavour. There was plenty of apple, some lemon and something rather tastily like melon, but not quite. There was a little florality following behind, which was a little strange. I’d just got my head around the oakless thing, and now I was having to deal with blossom coming after fruit. The world was turned upside down, but that’s no bad thing. I really enjoyed this wine but would perhaps not have placed it as a Rioja in a blind tasting. I’ll look out for it again. It cost £8 in the little Sainsbury’s local, which seemed a fair price, but I wouldn’t be surprised to see it in a multibuy offer in a bigger store with a 10 or 20% discount.